A beautiful Saturday night greeted a large crowd for an action packed night of racing at the Oakshade Raceway. Over 170 cars occupied the pit area and would treat the spectators to over 30 different races before the night was through. The Bomber division was up first for its double features. The A Main picked up from where it was stopped last week as the rains came down. Mike Lazier was the leader 4 laps in with Chris Joy in close pursuit. Tony Tolles was the man on the move taking the lead from Lazier and then pulled away after working his way up through the field. Tolles would slip high in turn four and fall back to 6th on lap 12. Lazier then reassumed the lead and held off Dan Bleikamp for the win. Tolles worked his way back up for a 3rd place finish. In the B Main, Gary Schaffer got by Mark Frost for the lead. Bill Stoner and Frost got together putting Frost into the wall and eliminating him from competition. Schaffer held off Ted Goetz Jr. to win. Danny Hogrefe got by Doug Miller to pick up the victory in the C Main. Late Model feature action was up next after numerous exciting heat race events. Bill Hahn jumped to the lead after starting from the pole. Tracy Grimes moved up to 2nd after starting on the outside of row two. A caution mid way through the event tightened up the field and Rod Schroyer and Kris Patterson would both move around Grimes on the restart. Bill Hahn continued to lead as Patterson got by Schroyer for 2nd. 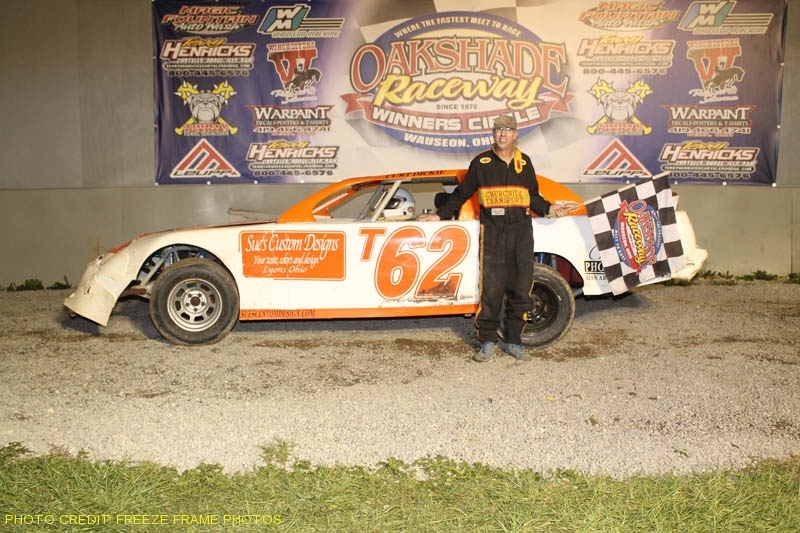 Then, in one of the most exciting finishes of the year, Patterson made a move on the backstretch on the final lap to get by Hahn for the lead and the win for his 3rd Late Model A Main Victory of the year at Oakshade Raceway. Hahn finished 2nd followed by Schroyer. Craig Keel had his 360 Sprint hooked up for his feature event. He darted into the lead on lap two and didn’t look back. Two potential threats for the lead had problems on lap 9 as Jeremy Campbell and points leader Todd Heller got caught up in an incident while working through slower traffic. Both wuld continue, but had to restart from the tail. Craig Keel went on to an easy victory. It has been the same story the past few weeks in the Sportsman feature action. Chris Smith takes the lead on the first lap and would pick up his 4th feature win in a row. Tom Bennett would use the low groove that has worked so well for Smith the past few weeks to finish a close second. Then it was time for a second round of Bomber features. The second Bomber A Main of the evening would produce a good battle up front between Todd Silvey, Danny Nighswander, Randy Roseman and Dale Cole all running nose to tail. Nighswander would get by Silvey and then pull away to win his first A Main of the year. John Laney made a power move on the outside of Jason Smith to take over the top spot in the second B Main. He would go on to win holding off Chris Joy, Jason Smith and Jeremy Grover after a couple late cautions set up a shoot out to the finish. Gary Schaffer would win his second feature event in the C Main and Bill Stoner would finish ahead of Ramon Roby and Adam Flint to win the D Main. This Saturday at Oak Shade Raceway is Auto Value Night featuring the UMP Late Models, 360 Sprints, Sportsman and Bombers. Gates open at 4pm with racing at 7pm.